The Huzzaz video player can help you easily embed Facebook videos and Facebook live streams into your website and manage your website’s video content. Showcase all the videos that are important to your audience and organize them in a way that makes the most sense. Facebook allows you to share, upload or live stream video and insert them directly in to your followers’ Facebook feeds. However, the downside of relying only on Facebook for sharing content is that within 12 hours, a Facebook post will have already reached 95% of the people it will ever reach in it’s lifetime1. 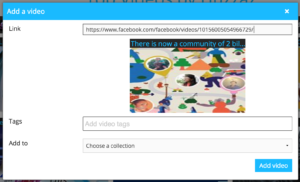 With Huzzaz, you can share videos to Facebook and your own website without much effort. You can take advantage of Facebook’s social media platform and create a permanent home for videos you want to showcase. Your audience can watch, search, and discover all the videos you want to share directly from your website whenever they want, even if it’s a week after you posted the video to Facebook. In addition to Facebook videos, Huzzaz also allows you to seamlessly integrate videos from YouTube, Vimeo, or Twitch into the same video player. 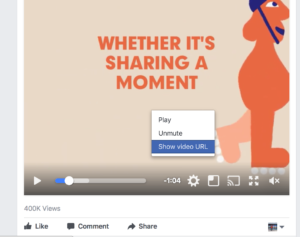 Right-click on a Facebook video and select “Show video URL” from the menu. It can either by a Facebook live stream or regular Facebook video post. Add the video to your Huzzaz video collection by pasting the FB video URL. It’s that simple. Whenever you add or reorganize videos to your Huzzaz video collection, your website will automatically be updated. If you haven’t added a Huzzaz video gallery to your website yet, you can get started here.